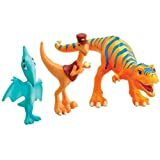 My son loves watching Dinosaur Train, so when i saw that they made these figures i HAD to get him some. He loves playing with the dinosaurs by themselves, or with the train cars (came with other dinosaur train figures). I will definitely collect all of them for him. The only down side that i see is that some of the dinos that have smaller feet (like Conductor), tend to be top heavy so they dont stand on their own. But my son doesn’t even notice. Definitely a cute, worthwhile investment! Love them!